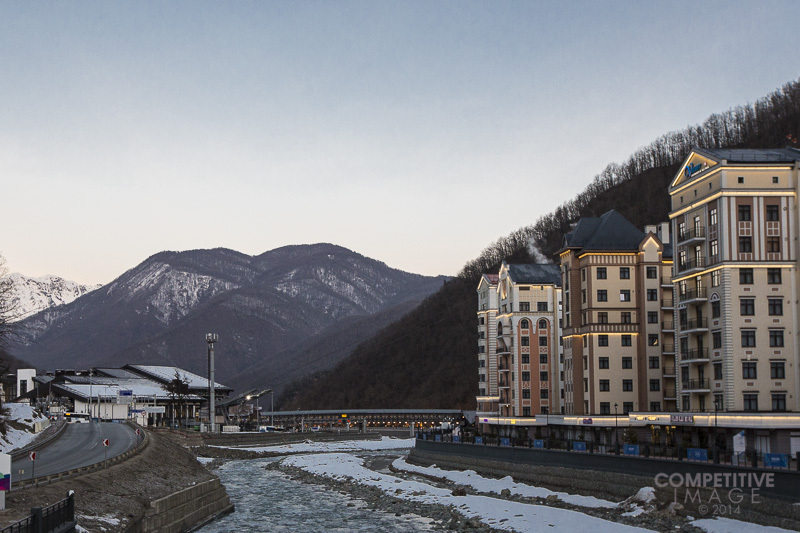 Sochi – A Day on the Coast! Getting off of the Media Bus at the Main Media Center was a bit bizarre. It was 60 degrees and sunny! My system is just not wired for that in February, but I LIKE IT! My first stop was the Ice Cube Curling Center. Now in my fourth day of shooting, I am starting to see some of the same photographers that I have seen at other venues. Good guys and really good photographers. Most are really helpful, professionals and easy to work along side of. I am sure the others would be too, if we had any idea what the other one was saying! I have been having fun with the Brits, Aussies and Canadians, eh! Please don’t ask me to explain the details of Curling, but I understand there are Stones, you have to get it in the House and the closest to the Button to win a point, but sometimes you can get two points. What I do know, is that it as intense as any sport out there; and if there was a staring contest, these guys would win hands down. After curling, I took a deep breath and headed to the Iceberg Skating Palace, where I saw my friend Paula Kim. Paula had previously been the ITU Photo manager and was now the Venue Photo Manager. At least I had shot and somewhat understood Short Track Speed Skating, which you can generally describe has high speed mayhem in a small oval, with flashing sharp blades and resemble something from Iron Chef. As you see the thickness of the padding on the sides, it becomes obvious why it is there. I made it back to my apartment by 6:30, had a farewell dinner with my buddy Dave who has been here working for 3 months – really great pizza and a beer or 2. The recent reports about the problems with the media housing, probably would not have had much of an impact on me had I not just watched the Discovery Channel Series – Klondike. In the days leading up to my trip, I spent entirely too much time trying to track down details about which hotels where having issues and envisioning slogging through mud filled streets. Just in case, I was able to pick up a light blub in Moscow – like that was going to save me from anything! The Moscow Airport had a special line for credential holders traveling on Aeroflot and as a Delta partner, my Sky Priority Boarding made getting my gear on easy. Upon arriving in Sochi, there was certainly a celebratory atmosphere, with the anticipated 100,000 visitors coming through the airport. I was able to immediately able to get my credentials validated and then pick up my luggage (everything made it!). Volunteers where EVERYWHERE! The young lady with the clipboard had my name and told me I needed Bus TM17 which would take me directly to my hotel. Another volunteer, Alexander, a writer from Siberia, helped me with my luggage and would check on me every few minutes to make sure I was doing well. About a 20 minute wait for the bus and we were off. Yup, we talked about the weather in Siberia compared to Minnesota – pretty close for 2014. New highways (with dedicated Olympic vehicle lanes), new tunnels, new bridges, new water treatment plants and a new rail system. It is really pretty easy to see how you could spend $50 Billion or so, even if it was all efficiently used. My only glitch of the day was that I was dropped off at Valet Hotel #3, instead of the Valset Apartments #4. An easy 4 minute walk, which with all my luggage was made easier going down hill. No mud, no workman just a bedroom, bath and a kitchen in a ski village, with a great view. It is pretty spartan, ok, VERY spartan. but when I compare it to many of the places I have stayed over the years, this is pretty nice. Not perfect, but pretty nice. I have been doing a little decorating, putting up a ski area map and the event schedule on the way – reminds me of my college dorm! No one can think of everything, the fan vent above the stove does only vents into the cupboard. I guess that means I shouldn’t cook anything too smelly or smokey! I have lots of room to spread out and work. In short, airport to hotel and checked in with the media center. Much easier than London. After getting settled in last night I headed down to the Gorki Media Center for the Mountain Cluster. I picked up a few necessities (my photo sleeve – more on this later), a Sochi SIM card and a bit to eat. The Press / Photo workroom was already filled. This morning, I had a short walk back to the original hotel where they serve breakfast. Three minutes out my door I run into my good friend from Boulder, Dave Taylor. Dave has been here since December working with the Olympic Broadcast Service. It is amazing how quickly you can feel at home by seeing a friendly face. Here are a few snaps of my new neighborhood! I am on the 7th floor of the building in the middle on the right. 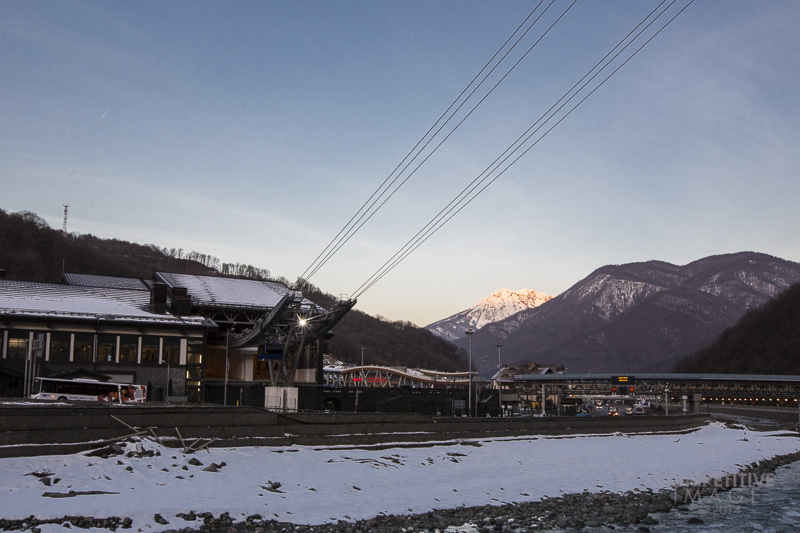 On the lower left you can see the Rosa Khutor Transportation Hub. 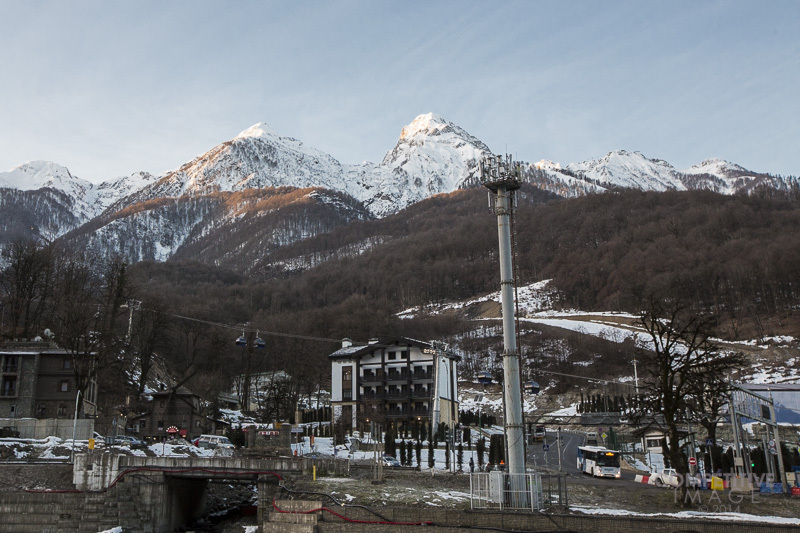 A short walk from the hotel and I will be able to take the gondola up to the right to the Nordic area and I go up to the left, I will get to the Alpine events. My view of the Alpine areas across the street. The base station for the gondolas. Right now I am on the wait list for an Opening Ceremony ticket – hoping I continue to get lucky! Finally for all of those wondering, yes I feel quite safe, which is no excuse for being stupid!